Moving can be a very tough transitional period in peoples’ lives, especially children. Although they may be young, they could have already formed personal relationships with friends at school or neighborhood kids. But if it’s necessary to find a new place to live, you want to make sure it’s a place that’s family friendly. Scour the neighborhoods you are interested in. The main thing that should lead you into the right direction would be schools. You want to ensure your child has an effortless switch to a different set of teachers and students. The best time to do this of course would be right at the end of the school year or just before the beginning. The next thing to look for is types of living arrangements which are suitable for families. Are there large homes on the market that allow each kid to have their own room? Is there a pool or a backyard? How about a recreation room or a basement where they could play? If it seems like all those features are extra and could make the rental rate too high to pay then consider cutting back on size. If you opt for a smaller apartment inquire about the occupancy rate. Find out how many families live in the building. Take a tour around and try to spot children, do they seem happy? When you find an area that you like with rental rates that are a fair price, it’s wise to go for a walk around the block. See what is within close proximity to the potential apartment you will rent. Are there parks, or restaurants, convenience stores? Is the surrounding area a safe environment? Is it somewhat tucked away or on a main street? Security is always important, houses or apartments on main roads can be dangerous for children. If you do plan on living somewhere like that, make sure to instruct your children on how to properly cross the street. Remind them never to cross alone and to always be alert and aware. Once you have signed a rental agreement, it’s time to furnish the unit. Buy comfortable pieces, like couches and pillows in fun prints and colors. Designate plenty of space for concealed storage. The kids will surely have many toys, but they don’t have to be out in the open all the time. 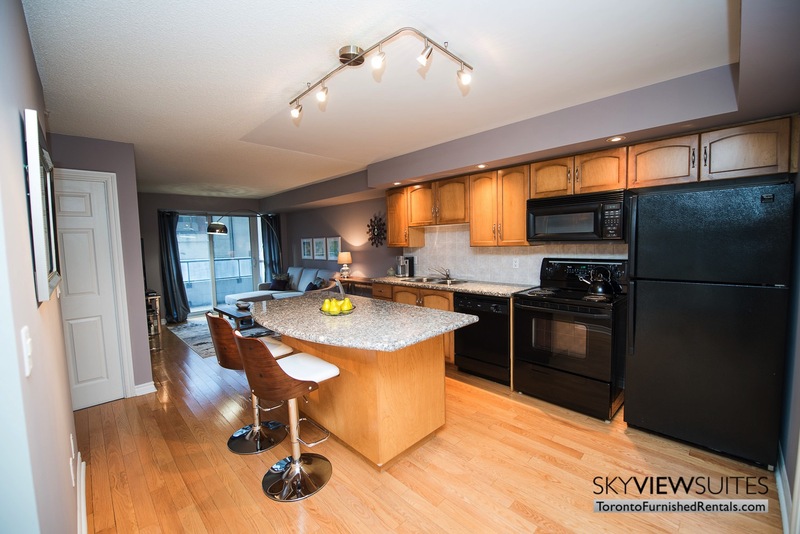 If you would prefer to move your family into a furnished apartment for rent, SkyViewSuites has family friendly units for you. Please visit www.torontofurnishedrentals.com which shows you a wide range to choose from.